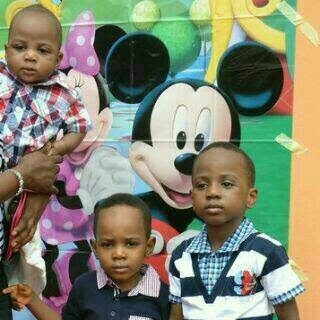 Today makes it 5 days since 11 months old Aderomola Orekoya and his older brothers, Adedamola Orekoya, 4, and Demola Orekoya, 6, were kidnapped by a newly employed nanny from their home. Some days after the kidnapping, the kidnappers contacted the family to ask for a N13million ransom within 2 days or they will loose their kids forever. 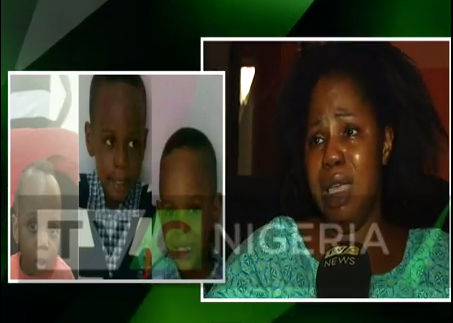 According to a report over the weekend by PUNCH Metro, Mrs Adebisi Orekoya has spoken out further on the circumstances surrounding the kidnapping of her 3 sons. She says that the new nanny who took the children looked older than her age and claimed to be an indigene of Oyo State, which was questionable because of her accent. “We had someone who was taking care of the kids before now. But the woman did not show up on Saturday and Sunday and we urgently needed someone to assist because we were going to resume work on Monday. We were disturbed and that was why I posted the information on OLX. 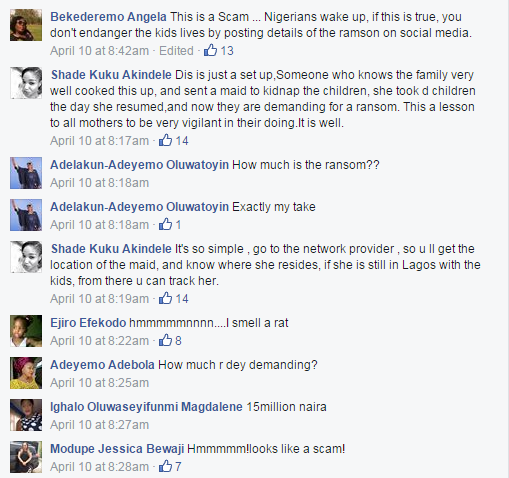 “She (Akinloye) called us and said she was interested. She said she was 23 years. I agreed to employ her in the interim because I really did not like the fact that she was young. She agreed to collect between N10, 000 to N15,000 even though our former nanny collected N25,000. “We spoke with two people she introduced to us as her brother and sister. They confirmed that they were her relatives. They gave us a vague description of where they lived in Ikorodu. We agreed to do proper documentation this week. The purported relatives had since remained unreachable on their telephone lines, and though the family was said to have contacted the police from the Itire division, nothing much has come forth of their investigation to rescue the children. Some commentators on the Facebook post above think the mother or family member may be involved in the kidnapping because she is seeking online donations for the ransom, but that idea seems far-fetched. Here's praying the little ones come home soon. oh God please help them.. hmm end time!